Love this quilt. 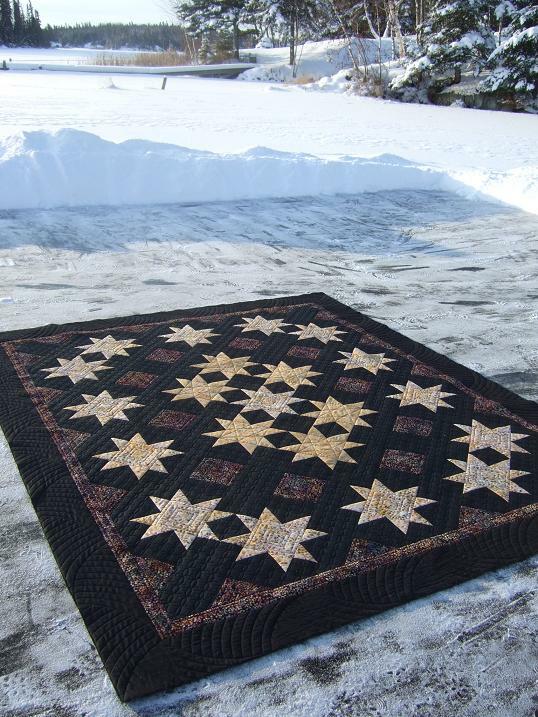 The gold/yellow stars really shine in the sun. 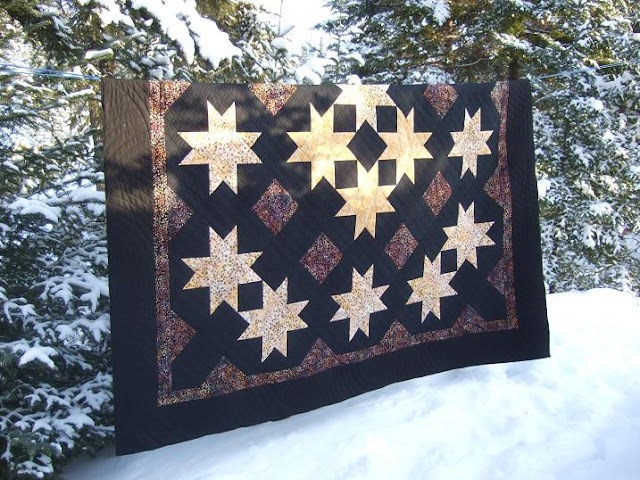 Your quilting is amazing on this and I'm sure it will be loved lots. I love it! 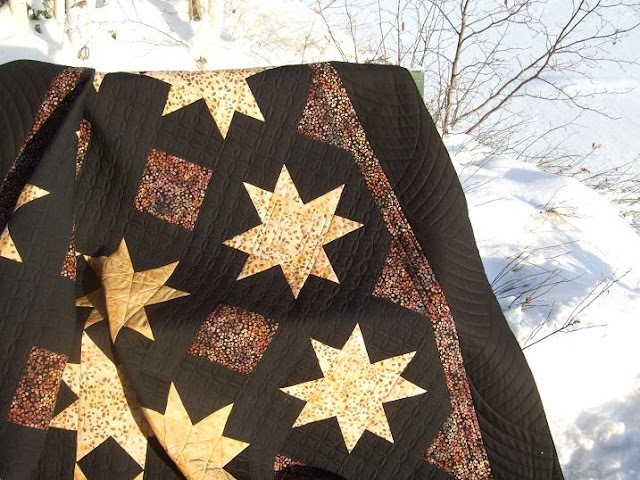 I really love the CC for the background quilting. Of course I especially love the color palette! 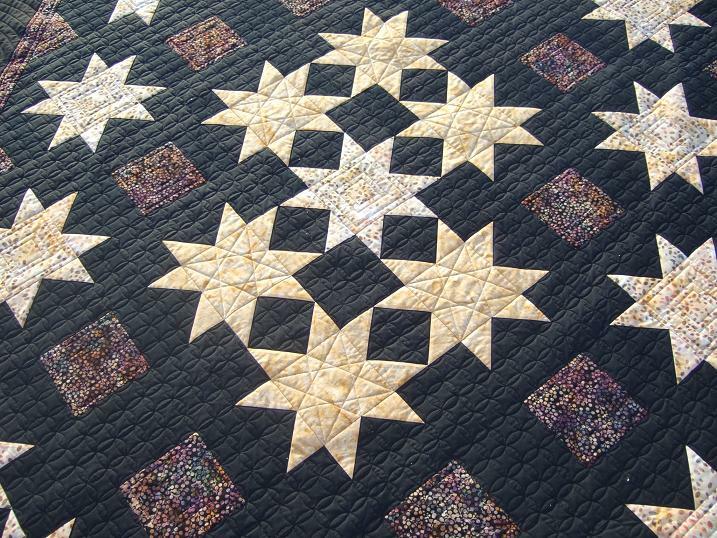 I love, love, love your quilting. 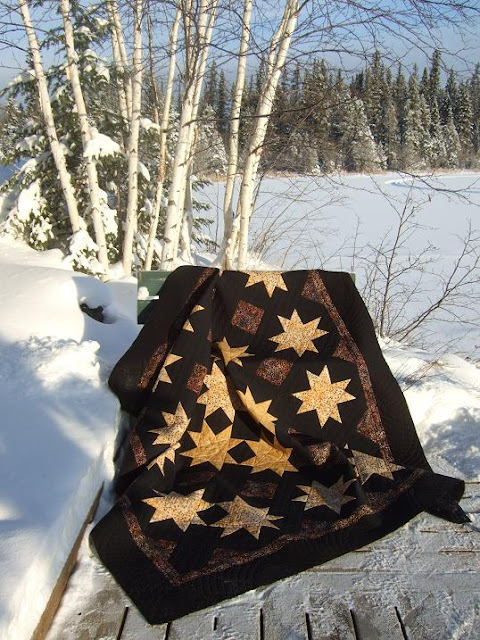 You always seem to find exactly what the quilt needs to let both the quilting and the piecing shine. My two kids (and me!) 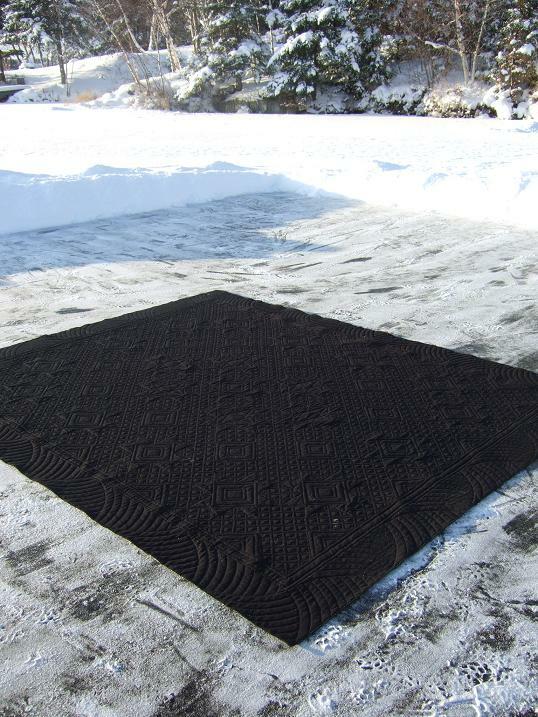 are rather envious of your rink and snow. Still brown and no ice here. This one is really special. Your quilting is beautiful and well designed. It compliments the top perfectly. Well done! Gorgeous!!! 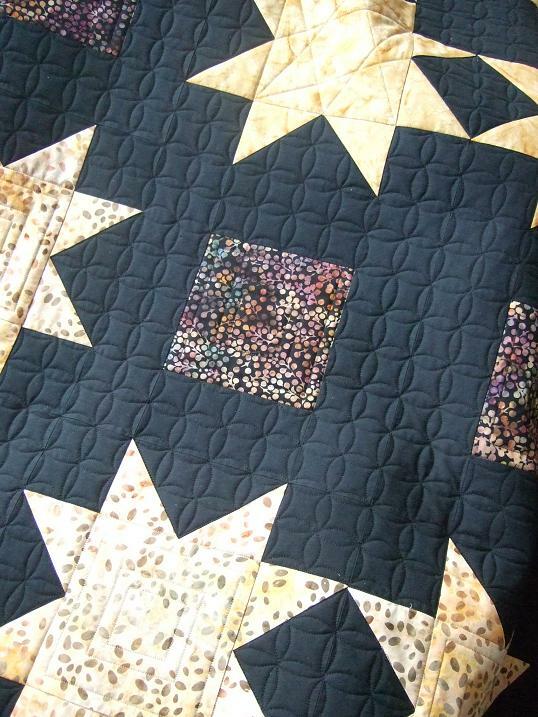 I just love the quilting!!!! The back looks just as stunning. Reversible. I love all the curved crosshatching. Your son is going to enjoy that quilt for years to come. beautiful work. I love your wonderful outside photos too. I just love new ideas! The quilting is stunning. 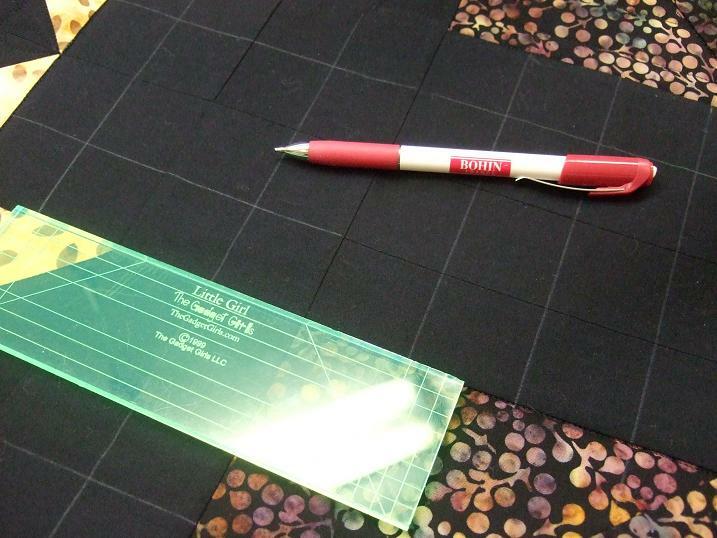 I'm going to remember the black sharpie trick...I have a black backing planned for the future. I can totally relate to your extra exercise shoveling snow. Less guilt when I grab a handful of M&Ms. Beautiful Kathy, I could tell already it was for a special person, it will be treasured! WOW! Love the background Kathy! Those CC's are perfect! They look so cool! Okay, so how did you get them so perfect? I always cop-out and do the curvy CC's instead! Did you use a template to get the lines so perfect or are they freehand? Either way, beautiful job! Our guild just did a quilt with those CCs behind the applique, and it was done with a computer...this looks just like it! Great job again! Thats beautiful Kathy. Its so effective! Kathy! Wow you did an awesome job with that....love...love the cc on the grid! You've inspired me so!! Stunning! And that last picture should be on a calendar or something. It's beautiful.